Shortly after posting her profile on Match.com, Mi Jin Nam was contacted by Roger Liu. 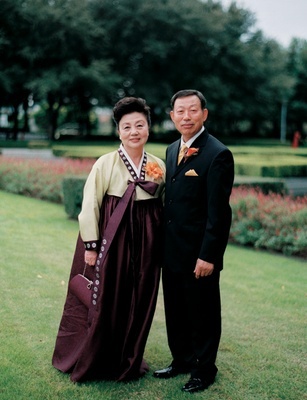 Geographically speaking, Roger was not an ideal suitor -- he lived over an hour away from Mi Jin's home in Los Angeles -- but their growing list of similarities made him too tempting for Mi Jin to ignore. 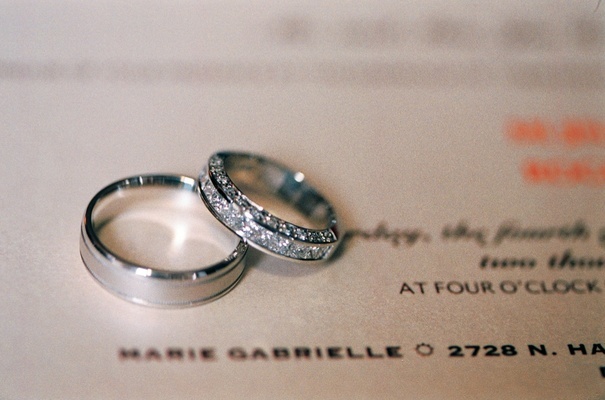 Several emails and phone calls later, the two went on their first date. 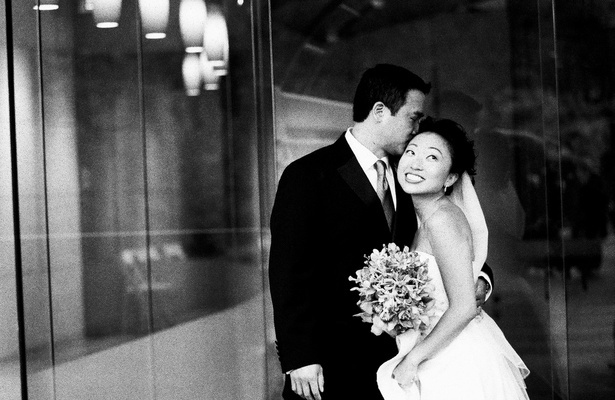 "The instant I sat down in his car and we began talking, I felt comfortable," says Mi Jin. "Getting to know Roger was fun, exciting, and effortless. It didn't take long for me to sense that I had a future with this man." The feeling was clearly mutual and some time later, Roger began ring shopping. One day while they were having a casual conversation, he spontaneously and "unofficially" proposed to Mi Jin from the heart -- but without a ring. 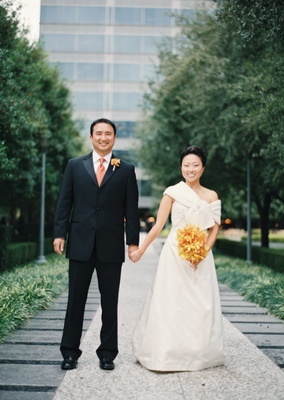 Fueled by their promise to one another, Roger and Mi Jin picked out a ring together, and two weeks later, he asked his lucky lady to be his wife all over again. 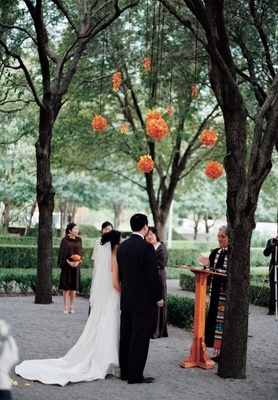 The bride and groom debated briefly over where to host the wedding but ultimately decided to gather their loved ones in Dallas, where Mi Jin's family is located, instead of L.A. Desiring an outdoor ceremony, the couple chose a date in early November to avoid the Texas heat but still ensure a comfortable climate for the alfresco gathering. 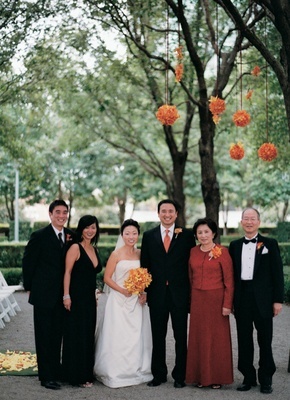 The downtown restaurant Mi Jin and Roger selected was the perfect combination of features they were looking for: it boasted a tree-filled garden for the ceremony and a chic dining room for the reception. 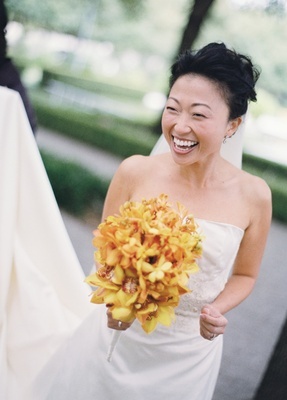 Mi Jin set about planning the sophisticated yet simple affair without the help of a wedding coordinator, relying instead on her own elegant sense of style and the wisdom of her recently married girlfriends. 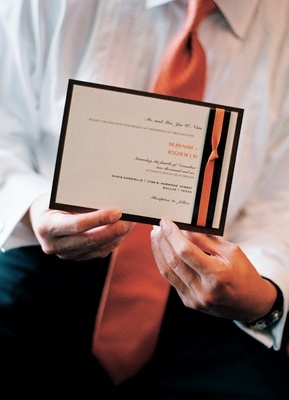 The rich color scheme for the event was first announced via Mi Jin's handmade invitations. 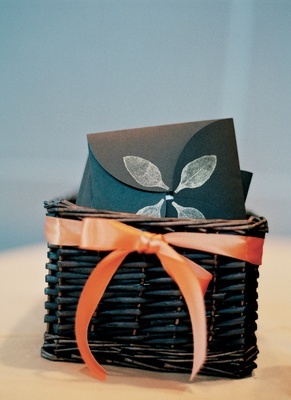 Creating the modern design of cream and chocolate brown paper embellished with an orange, knotted ribbon turned out to be a labor of love. 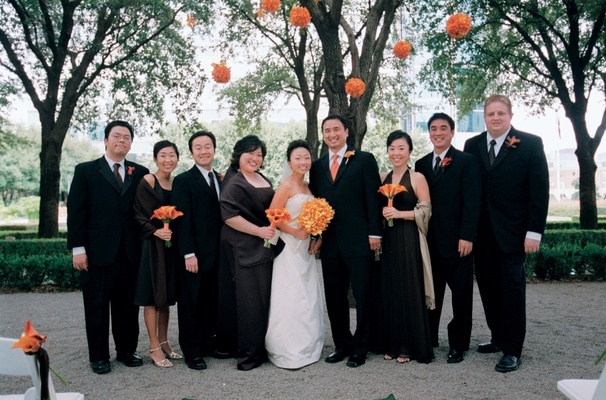 "The process was painstakingly long and frustrating at times but well worth it because the invitations really reflected us," recalls the bride. 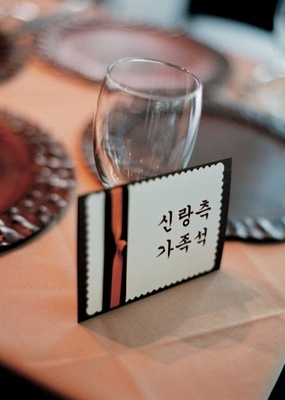 The stationery's style was carried over into the ceremony programs and table numbers, both of which were translated into Korean to accommodate many of their foreign guests. 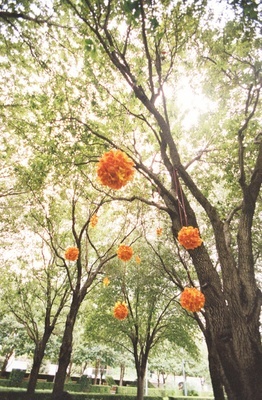 But one aspect that was not lost in translation was the original vows Roger recited to his bride while standing beneath a canopy of whimsical floral balls. "All the women, including me, were crying," remembers Mi Jin. 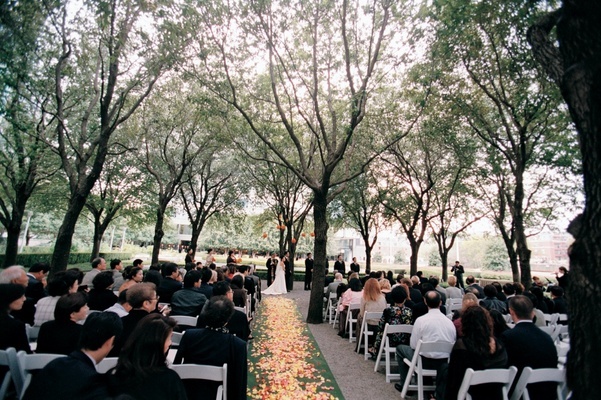 And just after the ceremony concluded, a light rain began to fall. It did not deter the proud father of the bride from continuing with his speech, however, until his son finally urged him to wrap it up so everyone could take shelter indoors. "It was really funny," says Mi Jin. 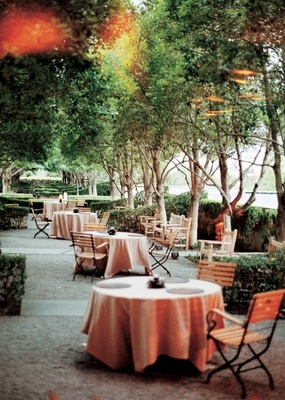 Inside the restaurant, guests dined at tables dressed in the signature colors of the event. 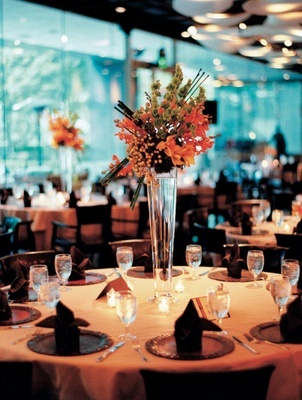 Centerpieces alternating between high and low arrangements of orange and gold orchids, calla lilies, and green Belles of Ireland stood out against the cream and brown table linens and chairs. 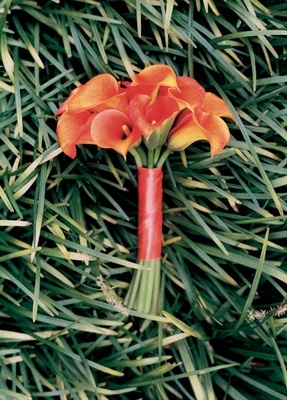 The look was sleek and contemporary with a feminine twist provided by the delicate flower choice and ribbon detailing. The cake, too, expressed the tone. 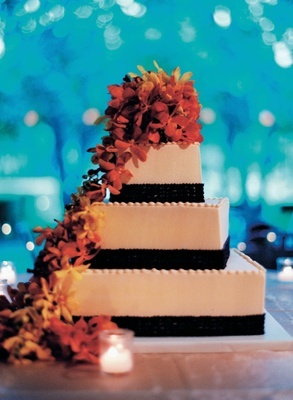 Three square layers covered in white frosting and wrapped in chocolate brown bands were given a vibrant punch by a waterfall of orange orchids. "We wanted something modern and simple," claims Mi Jin, and this design fit the bill. 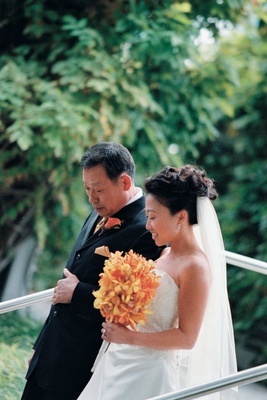 And even though Mi Jin and Roger were prepared to follow their own advice of expecting -- and embracing -- the unexpected, "Overall, the day was everything and even more than we'd hoped for," she said. The newlyweds departed happily for their honeymoon, touring New Zealand's South Island before heading to Australia.